Feverfew is a herbal remedy taken to soothe various types of pain including headaches, arthritis and muscle aches. It is also said to lower blood pressure and improve digestive processes while also stimulating the appetite. This makes it a viable treatment for things like colitis and nausea. It is very popular and stacks up to pharmaceutical nonsteroid anti-inflammatories. Essentially feverfew acts in many of the same ways that ibuprofin or aspirin would. It is best known for its treatment of migraines, because many consumers find it very effective. 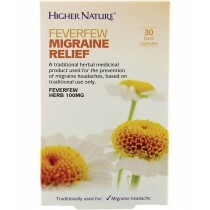 Feverfew may even prevent headaches or significantly reduce their frequency if taken regularly. For sufferers of migraines this is a great solution because by taking a natural, harmless supplement consistently, they can reduce the pain and inconvenience of severe headaches. Feverfew is also a well-liked remedy for menstrual and pre-menstrual symptoms because of its muscle relaxing abilities. It works to fight off uterine cramps and backaches.